Scrivener is your one-stop-shop for everything an author needs to plan, research and write a story or article. It can even be used for school projects and assignments, like essays! For only $40 (after a non-consectutive, 30 Day free trial) you can save time and money by not wasting your efforts on sorting through piles of paper notes or learning several different and complicated computer programs. 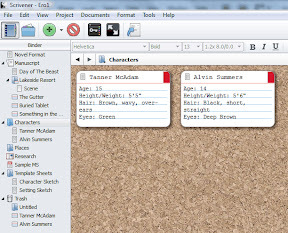 Scrivener is a mind-mapping program, a word processor and a reference guide to all of your research and notes. It keeps everything like chapters and scences and characters and profiles, all the way to your research and places and thoughts. Not only this, but it also provides you with templates for character creation and manuscript formats. One of my personal favourite features of this program is the bulletin board. It gives a visual representation of all of your chapters, scenes and characters, and allows you to easily rearrange things by simply dragging them to where you want them to be. This is particularily useful if you write your story in segments and like to play around with your scenes and find a more interesting or seamless story. You may be thinking that paying for a program is a downside, but it’s not! Other word processors range in price from $50 to even $500. And after you’ve bought the program, you still need something to help you plan your story and build ideas. That can translate to either a huge stack of cluttered papers or hundreds more dollars on other programs. Even if you decide to choose a freeware program, that can still takes hours to learn. Why complicate something when you don’t have to? Save money and time and take a good, hard look at Scrivener. Visit literatureandlatte.com to check it out!